Work with others all over the world. Increase their learning and life independence. Experience self-initiated learning within and beyond the classroom. 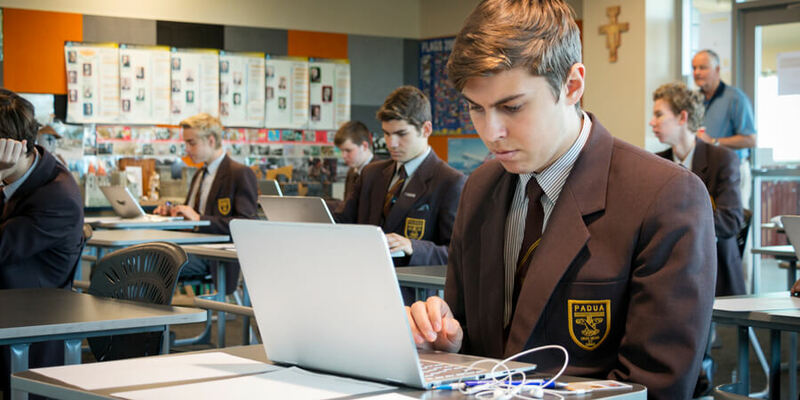 Padua College strives to embrace and integrate technology across all subjects and year levels with students having access to a range of applications and learning programs. My.Padua is the College’s portal providing access to a range of information related to the students’ education and College involvement. It is designed to be the single point of entry for all students, staff and families. From the dashboard (landing page), calendar information, notices and due work for students can easily be seen. Top and side menus provide easy access to reports and e-forms (MiClass), online payment (FACTS), PaduaTV, individualised assessment calendars and sports information. The My.Padua platform integrates with the College app to provide a mobile platform for accessing information and resources anywhere there is an internet connection or mobile data coverage. My.Padua is the main information source for parents. Students access to learning content anywhere there is an internet connection. In-built calendar which will also allow parents access to their son’s academic goals and deadlines. Assessment submission and plagiarism checking facility to protect students academic property and provide guidance in referencing skills. Reporting facility for teachers to check student access to courses and content. The ability for students to self-assess their progress on assessment tasks. The ability to differentiate assessment tasks. The College operates an opt-out model 1:1 laptop program. Students automatically become part of this program as a part of the enrolment process. Ordering for the devices is via an electronic e-form. Details of the program are outlined below. To ensure every student has a fully functioning device with them for every lesson during every school day. As technology is evolving to meet the needs of students, parents and teachers, our Information Communication Technologies (ICT) services dynamically support the end user and how our community interacts with technology offered by the College. Extensive Portal and Online Services. The IT Help Desk team supports the expectation with technology being an integral part of life at Padua College. We support and maintain the ICT infrastructure for the school ensuring that all users will have access to appropriate school resources for use every school day. If something isn’t operating as anticipated we provide identification and resolution of issues during business hours via our experienced ICT team members, in conjunction with third parties, for example; Datacom or Internet Service Providers.